Yesterday afternoon this tweet [screengrab above, in case it gets deleted] popped into my stream, as a result of a RT from a friend. This friend has thousands of followers, and tends to pick content with care, so it caught my eye. I’ve been interested in this type of message for a long time now. I wrote a piece over three years ago about the consequences of asking people, en masse, to amplify a lost person message – along with some suggestions on safeguards that might help us hang to some of the benefits but minimise wasted time and miscommunication. 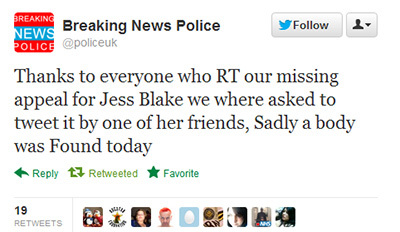 I took a closer look at the account behind this tweet, @policeuk, because of its name. UK policing is one of those sectors that has its own .uk domain (like nhs.uk, mod.uk etc). In the case of the police, the website Police.UK has a highly distinctive branding as a primary source of official crime and policing information online. So, not unreasonably, I concluded that @policeuk was so similar to the “official” brand as to be of genuine concern. What is the @policeuk account? 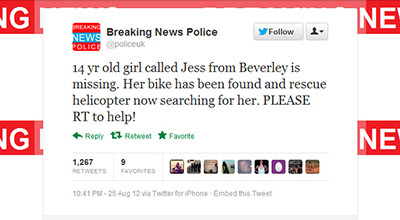 It claims to be a “Breaking news” feed – amplifying stories related to policing. Nothing wrong with that by itself. There are tons of accounts doing similar things. Good luck to them. But the weight given by “RT @policeuk…” seems to be a pretty powerful accelerant. That tweet’s currently had over 1,200 RTs. AntiWinsorNetwork? Wossat then? As far as I’ve established, it’s a grass roots policing community campaigning brand that arose at the time of the Winsor review into police pay and conditions. And who are @gonzomedia? A self-proclaimed media organisation – with a website that doesn’t work. Hmm. They’re not this GonzoMedia, anyway. So is this really worth making a fuss about? Some worthless content gets RTd a lot? Lots of people waste lots of time on the internet? That’s hardly news. And it’s not going to be stopped by a few whiny tweets and a blog post. And is it beyond the realms of possibility that @policeuk could become recognised as a twitter brand that people start to turn to for help, or to report Serious Things? I think it’s highly possible. And that would be criminal. And if they don’t do these things, I fully expect the Home Office, ACPO, NPIA, or any of a number of other relevant organisations (who are all now aware of this issue) to have it taken down sharpish. I haven’t got going on the Facebook page, but it’s going to need similar scrutiny. It’s not a question of free speech. Personally, I’m saddened. I had no idea they’d suffered “5 days of constant abuse and campaigns” by trolls. After all, I only spotted the account about 5pm on Sunday afternoon. Whoever gave them the other 3½ days of grief should be thoroughly ashamed of themselves! Read this slowly, Facebook visitors and other newcomers: there is no trolling. There is no abuse. There is a bit of gentle piss-taking, because this is the internet. And there is a challenge to its branding, based solely on the way the word “police” is being used, with some clear suggestions on what it could do to fix this and carry on exactly as it has been. I also suggest that if it chooses not to, it’s very likely to attract official interest. Pointing those things out is not “trolling“. Oh, I’ve just noticed the Facebook URL. facebook.com/policeuk? No, I don’t think so. That should go too. I’m sure NPIA have an eye on this one too now. If you are now desperately missing real police output, can I suggest you go and find your local force page? They look like this. Or a Twitter account like this? The latter all have, or should have, a blue tick indicating they are genuine. Or go and get your newsy fix from, well, a real news organisation. There are plenty about. They have (mostly) responsible approaches to reporting, fact-checking, timely coverage and that sort of stuff. And if you want to bellyache about coppers with like-minded people, you’ll find a space. And if all those are too official, or propaganda-ish, do please set up your own bear-pit online space. Just don’t put “police” in the name. *if visiting from a Facebook link, this means “end”. Well, there we are. After a whole 24 hours** of flouncing and muting, they’re back. Not sure who these “haters” are, to be honest. Critics, well, that’s a different matter. Now, is this my problem? Nah. I suspect there are quite a few within the policing community who are now taking a good look at the branding issues involved. Over to them. I will await with interest what happens, and will post any updates here. I guess there are some for whom an issue like this could become an overwhelming, illiberal, ranting crusade. But I’m not one of them. **though in the compressed timescales of the guy behind these, he probably thinks he put his toys down for at least a month. Fascinating link from February 2012, from the Mirror. Read it for yourselves. But note that even a national newspaper (ok, not the brightest, but hey) said: “they wormed their way into a police Twitter account…” Well. That looks like form, as they say. And perhaps a piece of evidence to support what the case set out above. They were hacked, they say. Yeah, yeah, tell that to the judge. I’ve written before about something that would really set a rocket under the opening up of data: the vigorous pursuit of the useful stuff. When we’ve been given access to transport data, wonderful things have happened. When we get real-time feeds, useful services follow hot on their heels. Let’s make those infrastructural building blocks of services available for free, unfettered use: the maps, the postcodes, the electoral roll, your personal health records. Roll forward to a time when the first priority of any service owner within the public sector is not “how shall I display the accounting information about the costs of this service” (or indeed “how shall I obfuscate the accounting information..?”). Those basic, factual jigsaw pieces that allow any service to be found, understood, described and interacted with. From a map of where things can be found, to always-up-to-date information about their condition, and a nice set of APIs with which others can build ways in. Pouf. No more. Gone. The primary concern becomes: is the data that describes this service accurate (or accurate enough–with some canny thinking about how it might then be written to and corrected), and available (using a broad definition of availability which considers things like interoperability standards). Well, Paul. Nice. But what a load of flowery language, you theoretical arm-waver. Can’t you give a more practical example? Well, reader. Yes I can. That’s right. Public conveniences. A universal need. A universal presence. But where are they? When are they open? And what about their special features? Disabled access? Disabled parking? Baby-changing? There’s actually a bit more to think about (once you start to think hard) than just location and description. But not a whole lot more. The wonderful Gail Knight has been banging this drum for a while, and has made some good progress, especially on things like the specification for data you’d need to have to make a useful loo finder service. Why’s this really interesting? Really, really interesting? Because having got a good idea of the usefulness of the data [tick] and a description of what good data looks like [tick] we then find all the other little gems that stand between A Great Idea, and a Service That Ordinary People Can Easily Use. Bear in mind that any additional burden of work on a local authority (who have some duties around the provision of public loos) probably isn’t going to fly too high in the current climate of cuts. Bear in mind also that anyone else who does a whole load of work like this is probably going to want something in return. Bear in mind also that “having a sensible standard” and “having a standard that everyone agrees is sensible” are two different things. Oh, and I need hardly add that much of this data will not currently be held in nice, accessible, extractable formats. If, indeed, it exists at all. Two characters usually step forward at this point. The first is the Big Stick Wielder (“well, they should just make councils publish this stuff. Send them a strong letter from the PM saying that this is now mandatory. That’s the standard. Get on with it. It’s only dumping a file from a database to somewhere on the Internet, innit?”) BSW may get a bit vague after this about precisely where on the Internet, and may, after a bit of mumbling start talking about a national database, or “a portal”, or how Atos could probably knock one up for under a million… (and it’s usually at this point that some clever flipchart jockey will say “Why just loos? Let’s make a generic, EVERYTHING-finder! Let’s stretch out that scope until we’ve got something really unwieldy massive on our hands”.) We know how this song goes, don’t we? The second is the Cuddly Crowd-Sourcer (“forget all that heavy top-down stuff, man. We have the tools. We have some data to start from. Let’s crack on and start building! Use a wiki. Get people involved. Make it all open and free.”) CCS’s turn to go a bit vague happens when pushed on things like: will this project ever move beyond a proof-of-concept? how do we get critical mass? does it need any marketing? can people charge for apps that reuse the data and add value to it? how do we choose the right tools? Both have some good points, of course. And some shakier ones. That’s why this is a debate. If it were clear-cut, we’d have sorted it by now, and all be looking at apps that find useful stuff for us. And isn’t just a matter of WDTJ (Why don’t they just..?). My suggestion? CCS is nearer the mark. Create a data collection tool which can take in and build on what already exists. Use Open Street Map as the destination for gathered data. Do get on with it. Matthew Somerville’s excellent work to get an accurate data set of postbox locations and the Blue Plaque finder are obvious examples to draw inspiration from. Once in OSM, data can be got out again should the need arise. There will be a few wrinkles around the edges as app developers seek to make a return on what they build using the data. There may well be a case for publicly-funded development on top of the open data. But get the data there first. Make it a priority. Because if, after years of trying to make real-world, practical, open, useful services based on data we continue as we are, with a pitiful selection of half-baked novelties and demonstrators of “what useful might look like, at some point in the indeterminate future” we’re badly letting ourselves down. Basically, what I’m saying is: if we can’t get this right for something as well-defined and basic as loos, a lot of what we dream of in our hack-days and on our blogs about the potential of data will just go down the pan. OK, so it seems it already exists. Or at least a London version of it anyway. Don’t you love it when that happens? Would be good to see how it progresses, and what its business model looks like. I like the way that data descriptions have been used e.g. “Pseudo-public” for that class of loos which aren’t formally public conveniences, but can easily be accessed and used – e.g. those in libraries, and cooperative shops. The crowd-update function looks good too. Miscommunication is as old as communication. The dark side of all interconnectivity is its power to transmit the salacious, the fictitious, the misguided – often virally, often uncontrollably. From the very first email: “virus warning, tell all your friends” there’s been natural – if unfortunate – exploitation of the very human wish to help, collaborate and communicate. When this happens on Twitter, one big difference is that the explosion of communication happens much more quickly. Real-time response can of course be highly desirable. If you’ve just lost your child in a crowded train station, for example. Yesterday, this tweet sparked an avalanche of Re-Tweets, alerting hundreds (maybe even thousands?) 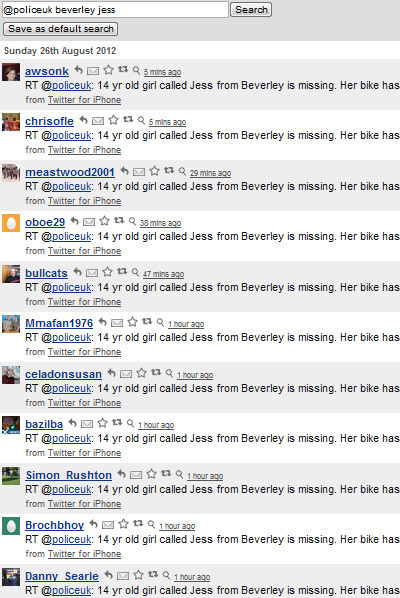 that a 7 year old girl had been lost. If you’re a parent, it’s probably happened to you. The most awful feeling. That paralysis, that fear: Where do I get help? Do I stay put? Do I run wildly around searching? In which direction? Who should I tell? Should I make a sudden, very un-British public demonstration of the situation? There are no perfect answers – but clearly in this case the report was serious enough to have already got to SE1, and the tweeting began. As I walked, I thought about whether there was a ‘best practice’ to using social media like this – every instinct telling me that ‘central places to report’, a #lostchild hashtag convention, a systematic urban-grid-search-plan with real-time mapping (thanks to @adrianshort for that) probably all had as many drawbacks and impracticalities as they’d offer by way of benefit. Nice intellectual exercise though. Eventually I asked one of the British Transport Police on the station if “the child was still lost” – and got the answer: “oh, the 7 year old, no she’s been found”. Which was enough to assure me that we were communicating about the same thing, and I had enough confidence to tweet this as an update, (which did get RT’d but probably with less gusto than the original alert). And I notified SE1 so that they could update their site (which they did in a slightly curious way). So, digesting all this, I offer the following suggestion on ‘good’ – not ‘perfect’ – handling of incidents like this. A: Authority. What authority are you drawing on for your information? “a friend of a friend says that this new virus threat is…” wasn’t good enough to spam all your friends, and it’s not good enough for a RT, imho. So, rule of thumb: if your source is more ‘official’ or evidently better connected on the ground than you are (yellow jackets, radios or established websites are pretty good indicators here), then this becomes your Authority; just make sure you reference it. B: Broadcast. If you have confidence in your source, tell your networks. That’s what they’re there for. C: Close the loops. Perhaps the most important bit, but guaranteed to be the one that gets missed the most. With your broadcasting comes a responsibility: either to follow up and update yourself, or to transmit an update that you hear of (based on a suitable Authority, of course) to your network in just the same way as you’d broadcast the alert. In some ways the closure is just as important as the alert – it builds credibility around the whole communication process. With crowdsourcing, no one’s in charge. No one ‘owns’ an incident. All information has some inaccuracy, and risk. Fictitious children will be searched for, and sacks of postcards delivered to an address down the road from where a child recovered from cancer five years ago. But think A, B, C next time you pass on something. Particularly if it’s as emotive and real as a lost little girl. And if you have a great idea to managing distributed information and agents in situations like this, I’d really love to hear it.